A United Europe. Is it a crazy idea? – or – Is it a necessary step in the evolutionary journey of the human race? The European Economic Community (EEC) was created by the Treaty of Rome in 1957. It was a regional organization which aimed to bring about economic integration between its member states which included Belgium, France, Italy, Luxembourg, the Netherlands and West Germany. Upon the formation of the European Union (EU) by the Maastricht Treaty in 1993, the EEC was incorporated and renamed as the European Community (EC). This provided a complete single market, allowing for the free movement of goods, capital, services, and people within the community. In 2009 (Treaty of Lisbon), the EC’s institutions were absorbed into the EU’s wider framework and the community ceased to exist. The EU now has 28 member states and has developed a single market through a standardised system of laws that apply in all member states. EU policies aim to ensure the free movement of people, goods, services, and capital, enact legislation in justice and home affairs, and maintain common policies on trade, agriculture, fisheries, and regional development. Through the Common Foreign and Security Policy, the EU has developed a role in external relations and defence. The union maintains permanent diplomatic missions throughout the world and represents itself at the United Nations, the WTO, the G8, and the G-20. The monetary union was established in 1999 and came into full force in 2002. It is currently composed of 19 member states that use the euro as their legal tender. Monetary union is fundamental to the concept of a United Europe; however, only 19 of the 28 member states have opted to join the single currency. This suggests that the nine states that opted out are not fully convinced that a United Europe is in their national interest. Their position was somewhat validated by the global financial crisis in 2008 which put enormous strain on the Euro. This strain continues to the present time and was recently brought into focus by the Greek crisis. Britain is also considering exiting the EU and a referendum is planned for 2017 to decide the issue. It is therefore crucial that the member states should, once and for all, decide if a United Europe is a crazy idea or a necessary step in the evolutionary journey of the human race. If it is a crazy idea, then we should stop throwing good money after bad and abandon the whole project. On the other hand, if it is a necessary step in the evolutionary journey of the human race, then all member states should fully support the idea and not be diverted by their own particular national interest – the common good of humanity should generally take precedence over national interest. To address these questions, it is first necessary to understand why there are so many problems in our world today. Only then can we understand what humanity must do to evolve to a more enlightened paradigm – and end the poverty, starvation, conflict, war, and suffering that plague our world at the present time. In our world today, 870 million people suffer from poverty and starvation. Of those 870 million people, about 21,000 people die every day of hunger or hunger-related causes. When you add to these numbers, the people who are killed or left destitute due to the many wars and conflicts, I think it’s fair to say that, as a whole, the human race is a very dysfunctional family. Even in developed countries, approximately 18 million people live in abject poverty and a very large working class are struggling to survive. The inequitable distribution of wealth is largely responsible for these problems – 0.111 per cent of humanity control 81 per cent of the world’s wealth. However, blaming the rich for being rich or the poor for being poor is a futile exercise. The only hope of escaping from this terrible reality is to understand why it exists. The main reason for the existence of the problems described above is the culture of selfishness, corruption, abuse of power, and greed (SCAG for short), which dominates in all the political, public service, financial, and religious institutions worldwide. In spite of all the major scientific and technological advances over the past 150 years, and particularly over the past 50 years, human consciousness has not evolved in any meaningful way for thousands of years – the SCAG that brought down the Roman Empire two thousand years ago is no different to that which caused the global financial crisis in 2008. It is necessary to state at this point that there are many honest, hardworking, generous people in all walks of life. However the significant point is that a critical mass is dominated by selfishness which ensures that SCAG will always dominate in our main institutions. The fundamental source of this SCAG culture is the natural trait of selfishness that is innate in every human being. However, rather that accepting selfishness as a fait accompli, we must try to understand why it is an innate trait in every human being and what we must do to overcome or balance it. 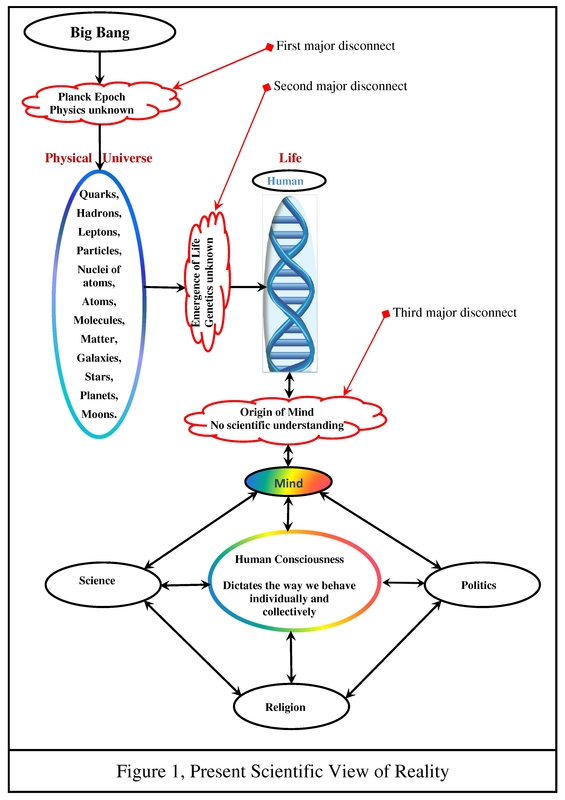 The present scientific view of reality, as summarised in Figure 1, is based on the mindset that the universe is purely a physical phenomenon. For the scientific arguments relating to Figure 1, please see my blog dated June 9th and titled ‘A New Scientific View of Reality based on the Grand Interactive Model’. If the universe is purely a physical phenomenon, then scientists (geneticists, biologist, etc) have little option but to regard life as purely physical in nature. All mutations are by chance. If life is purely a physical phenomenon, then the natural propensity of matter is crucial to the evolution of life, mind, and human consciousness. It is a scientific fact that the natural propensity of matter (the physical) is to evolve to states of lower complexity as explained by the second law of thermodynamics and the concept of entropy. A simple example to explain this principle is a steel pipe, which started its life as iron ore in the Earth. Through processing and the expenditure of a large amount of energy, the iron ore is transformed into steel pipes, which are at a higher level of complexity than iron ore. However, the natural tendency of the pipe is to return to its original state of iron ore, which is the force behind corrosion. Therefore, if a steel pipe is left unprotected for a sufficiently long period, it will return to the iron ore state again, a state of lower complexity. Therefore, if humans are purely physical in nature, then they naturally have a force pulling them to lower complexity. If we consider human consciousness in terms of complexity, the lowest level of complexity is to offer care and compassion to oneself only (selfishness). Examples of increasing levels of complexity are to offer care and compassion to family, community, society, country, and eventually to all of humanity; in other words, lower complexity equals lower inclusion, and higher complexity equals higher inclusion. The innate urge of the physical aspect to move to lower complexity means that if life is purely physical in nature, then we naturally offer care and compassion only to ourselves. In other words, this physical aspect of our being is naturally pulling us toward selfishness. Therefore if life is purely physical, then we have no escape from selfishness; which means that SCAG will always dominate in our world. There are logical scientific arguments to support a new view of reality as summarised in Figure 2. Mind is an energy generated in our DNA in much the same way that a magnetic field is generated in an electrical coil. Mind, and consequently human consciousness, is influenced by both the physical and non-physical aspects of our being. Scientists believe that dark matter is gravitational and dark energy is expansionary. 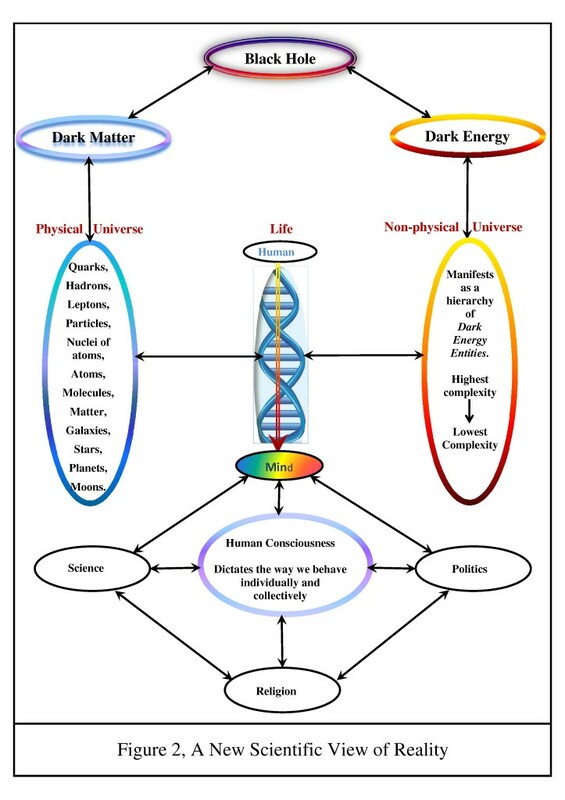 Therefore dark energy is the force that expands life, mind and human consciousness to greater complexity or greater inclusion, and consequently to greater enlightenment. It is therefore the force that can counteract selfishness and help us evolve to a more enlightened paradigm where love, care and compassion will be afforded to all human beings. However, to date, we have generally denied this expansionary aspect of our being and therefore there is nothing to counteract selfishness. That is why a culture of SCAG (selfishness, corruption, abuse of power, and greed) dominates in all our main institutions, which is the root cause of all the poverty, starvation, conflict, war, and suffering afflicting humanity at the present time. Based on these arguments a move to greater union is fundamental to a move to a more enlightened paradigm. Therefore a United Europe is not a crazy idea, but rather, being a step to greater union; it is a necessary step in the evolutionary journey of the human race.